The 1958 season was a big one for the Weideman family. That was the year the famous Murray stood in as captain and led Collingwood to a miracle flag. Much less well remembered, however, was the fact that another family member started his footballing journey at Victoria Park the same year. And while Peter Weidemann’s career would never rise to the heights of his cousin Murray’s, it was an extraordinary path nonetheless. 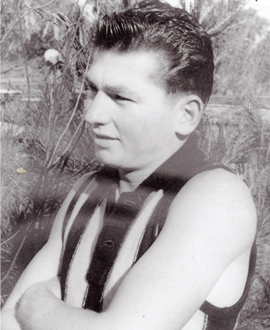 Peter Weidemann (note the original spelling with the extra ‘n’) came to Collingwood in 1958 to join the under-19s. It was the beginning of a decent apprenticeship that eventually saw him total 28 games with the thirds and a further 33 with the reserves. He also won the under-19s best and fairest award in 1959. He was added to the senior training list the next year, and was also rewarded with his first taste of senior football – a solitary game against Richmond at Punt Road oval. He was named in the back pocket that day, with The Age noting his reserves performances had been characterised by “rugged ground play and strong kicking”. Strongly built and hard at it, Weidemann would end up making his name in country football as a centreman. But in the VFL he tended to be used more as a flanker or back pocket. He was a willing runner (he had great endurance) and wonderfully courageous. The Age rated his debut as only ‘solid’, and said he hadn’t been as impressive as fellow newcomer Ray Willett. He was dropped the next week and didn’t reappear again for the season. Four more games followed in 1961, but at the end of that season the Magpie selectors decided they’d seen enough – and Peter was released. But that’s where his extraordinary footballing journey really began. The Magpies had a soft spot for Peter, and asked him what he would like to do. He said he’d like to do some coaching, so the Pies set him up with a position at Deloraine Football Club in Tasmania. He spent two years there, leading the club to a flag in his first season and winning the competition best and fairest in his second. He was a physical fitness fanatic, and his training sessions became legendary for their toughness – recalled in admiring tones even 30 years later. A popular and dynamic presence, he had a huge effect in a short time. From Deloraine he went to Coolamon in NSW, where he again won the competition best and fairest award (and more importantly met his future wife!). After leaving Coolamon he coached several other clubs, including Lockhart, before he decided to return to Victoria, and bought a farm in Fish Creek. He was enticed back to the field at age 40 (winning a club best and fairest in his first year) and also coached reserve and junior sides on and off for about 15 years. He coached his three sons at junior level and played alongside two of them: one of them, Wayne, would go on to be a fine footballer with the Adelaide Crows (Wayne was a big fan of Peter Daicos growing up, because he wore the #35 that Peter wore in his senior appearances for Collingwood). In all, Peter Weidemann ended up playing over 600 games of senior football. He was still playing at 52! In 1994, aged 54, he did a charity bike ride from Fish Creek to Coolamon – over 1000km – to raise money for cancer research. He arrived at Coolamon in time to help the club celebrate its centenary. The local paper there remembered him as “an outstanding coach and a brilliant player”. “Peter’s love of all sports, his incredible personal fitness and easygoing, friendly nature have won him a legion of friends all over NSW and Victoria,” the paper said. On top of the handful of senior games he played with Collingwood in the early 1960s, and the son who carried on the family name at the highest level, that’s a wonderful legacy to have left.